A new School of Leadership and Education Sciences (SOLES) website has launched at the University of San Diego, aiming to deliver information to prospective graduate and undergraduate students of the school. As with any major redesign undertaking at the university, we talked with our prospective audience as well as the SOLES academic and administrative leaders to gage goals and needs for their website moving forward. 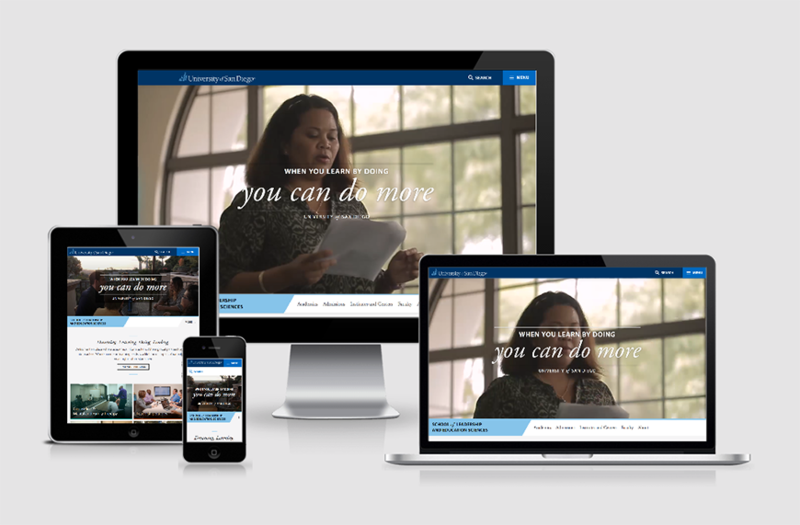 This is a standard element in USD's website redesign process, as websites must be relevant, timely, and useable for its prospective students in order to attract the high-quality applicants that the university is seeking. Customized audience pages for our prospective, admitted, and current students to learn about school news, events, or programs in a more personalized way. An engaging video hero area on the SOLES home page which highlights the collaborative student experience on campus. The video was directed and produced by the university's University Communications team. A faculty and staff directory with filtering, search, research information, and larger photos for learning about the award-winning faculty at the university. An integrated study abroad system which highlights opportunities for students based on world region, country, or term. The information provided comes directly from StudioAbroad which contains all of the study abroad opportunities available to students at the university. A new database-driven academic graduate program finder which allows a prospective student to consider their future employment and career goals and find the right program based on a series of questions and prompts. New systems such as job listings, graduate leadership internships, undergraduate leadership internships, alumni database, student organizations, and student scholarships. These are all database-driven and will allow for the continued easy update and delivery of information to interested parties. A new News Center, Events Calendar, and Featured Spotlights, all sharing information about the school, its faculty and staff, and related centers and institutes. This follows the same format as the university's News Center while highlighting SOLES-specific information. As with any major website launch, the work is just getting started. Now that the site is live, we aim to use data and analytics to gauge the usefulness of the site for its core audience and adjust to any changing and evolving needs over time.